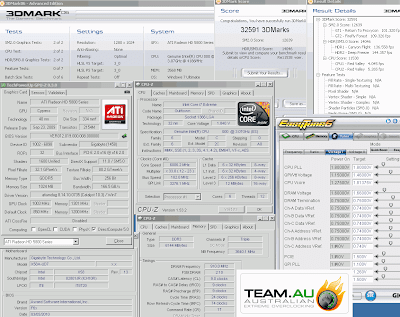 GIGABYTE Tech Daily: I finally got a chance to test Gulftown, 6GHz 3DMARK06 on Gigabyte X58-UD7. My God I'm in love!!! I finally got a chance to test Gulftown, 6GHz 3DMARK06 on Gigabyte X58-UD7. My God I'm in love!!! I love Intel's new CPU releases. They are ALWAYS so much better than previous tech it's just mind blowing. I got a chance to test Gulftown CPUs a few days ago on Gigabyte X58A-UD7 motherboard and found the whole experience extremely exciting. Overclocking was smooth, the CPUs love volts and scale properly, they scale properly with cold too. These chips are overclockers' wet dreams hahahah. Sorry I'm excited. I tested 3 CPUs and found a couple to have similar clocks and one to be trailing a bit behind. I havent seen many people do 6GHz with CPU intensive test so it was really good to see pretty easy 6GHz benching with only small amount of testing. The board was behaving pefect!!! Jump on Xtreme Systems for more pics, info and benchmark updates.